I don’t often read short stories in bulk but sometimes it’s good to have a short story feast. 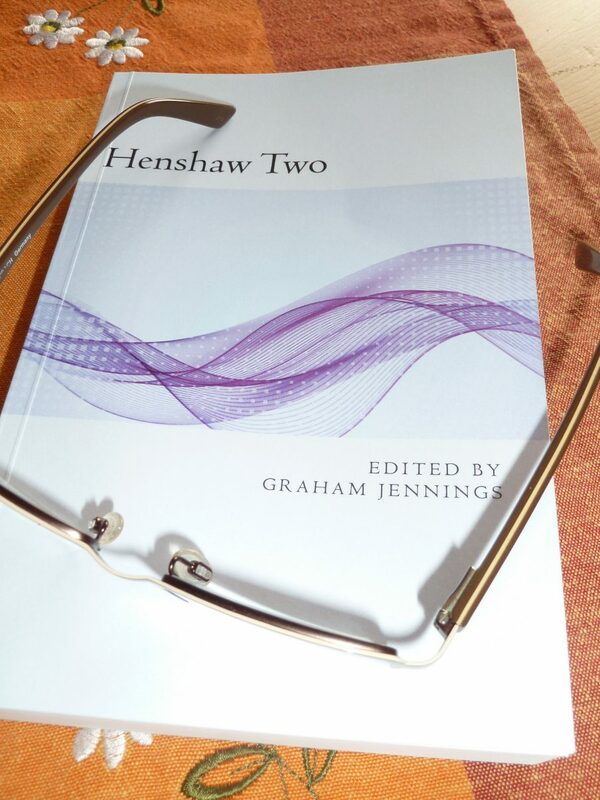 Henshaw Two, a new anthology of stories, is a tasty dish I devoured in two days. It’s a collection of thirty three stories that won or were placed in recent Henshaw Press competitions so the standard is pretty high. I’d describe the stories as mainstream and easily readable. They are more experimental than the type of story that appears in women’s magazines but they pull back from the challenging prose that finds favour in high-end literary journals. Some of the stories stand out for their deft approach to family relations. Traveller’s Rest by Lucy Brighton is a poignant, final, road trip to Mablethorpe for a mother and daughter. Anne Walsh Donnelly has two stories in the collection. One explores a mother/son relationship, hinting at a deeper meaning to its title, Unfinished House. In Lead Tears she gives us a child’s view of loss. In Journey to the Window, Joanne Shaw shows how a man and his dying partner can still have an adventure. The similar theme of love between long-married couples is beautifully explored in Gareth Shore’s The Ties That Bind. Such gentle, truthful writing. Ghosts put in several appearances in the collection. Here Nor There by Jeff Drummond gives us the ghost’s eye view of a haunted house mystery and we root for our spectral narrator all the way. More heart-breaking is The Promise by M.D. Hall – a Christmas story we would all dread. The disparate ghosts in Helatide by Finn Arlett wait on the station platform for the train into the next life. The twist in the tale is well served by Harriet Avery’s Ego, I. That’s the story that got me wondering what next? The Honey Trap by Jacqui Cooper is a sci-fi crime caper with a surprise ending. A stand-out piece was His Master’s Voice. Who’d have thought I’d empathize with a robot dog? Author Jennifer Rowe is a real talent in sci-fi writing. Some stories are not afraid to tackle the unsavoury side of our society. Mr. Pollock’s Bicycle by Christine Griffin and Rugged by Douglas Murdoch both depict violence against people who are “different”. One shows how good can defeat evil, but the other reminds us, sadly, that isn’t always the case. Beautiful Feet by Sue Mays is a clever piece of writing. The style is tongue-in-cheek but with a kick like The Handmaid’s Tale. The best story for me was Second in the Queue by Simon Van der Velde. A bleak, dystopian picture of Britain in the not-too-distant future when some people enjoy a gold-standard National Health Service. But what of the others with a silver card? If you like your satire on the gentler side, I’d recommend Situation Vacant by Deborah Came. The Four Horsemen of the Apocalypse want to recruit a fifth and call on the services of the Human Resources department. Sitting Pretty by Craig McEwan gives us a lovely variation on the boy meets girl story. Nicely done. My own story Cutting Through appears in the collection. It’s not a love story but shares similarities with Craig’s story. A great collection to make you smile and make you think. Read it at one sitting or dip in when the mood takes you. With thanks to Graham Jennings, of Henshaw Press, who edited this short story collection and worked hard to make publication a reality.